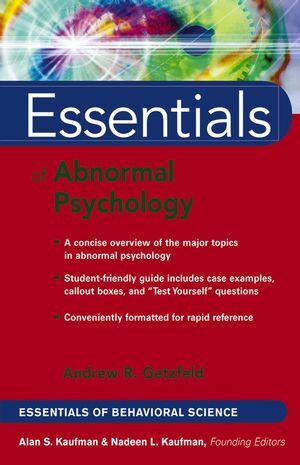 Essentials of Abnormal Psychology provides students and professionals with a concise overview of the major topics in abnormal psychology as well as chapters on the leading categories of disorders such as eating disorders, schizophrenic disorders, personality disorders, and substance-related disorders. This book utilizes the popular Essentials format and makes a perfect companion to primary texts on the topic or a useful study guide. As part of the Essentials of Behavioral Science series, this book provides information mental health professionals need to practice knowledgably, efficiently, and ethically in today's behavioral healthcare environment. Each concise chapter features numerous callout boxes highlighting key concepts, bulleted points, and extensive illustrative material, as well as "Test Yourself" questions that help you gauge and reinforce your grasp of the information covered. Andrew R. Getzfeld received his BA in psychology from Vassar College, his MSSW from the University of Wisconsin-Madison, and his Ph.D. in school psychology from the University of Tennessee-Knoxville. He has frequently presented a APA and NASP, and has chaired poster sessions for Psi Chi at EPA. Andrew holds licenses in both New York and New Jersey- as a licensed master social worker in New York, and as a certified school psychologist, certified school social worker and a certified alcohol and drug counselor in New Jersey. Presently an Associate Professor in the psychology department at New Jersey City University, and an Adjunct Associate Professor teaching graduate courses in the psychology department at New York University, Andrew's areas of interest include eating disorders and the addictions, abnormal psychology, child development, and psychopharmacology. Andrew also serves as a Psi Chi Faculty Consultant and is the Psi Chi Faculty Advisor at New Jersey City University. His first book, Abnormal Psychology Casebook: A New Perspective, was published by Pearson Prentice Hall in 2004. In his limited leisure time he enjoys international and national travel, swimming, reading voraciously, writing books, watching movies, playing the occasional computer game, and spending as much time as possible with his family, especially his extremely precious 4-year old daughter Anya. One: Introduction to Abnormal Psychology and the DSM-IV-TR. Two: Essentials of Anxiety Disorders. Three: Essentials of Mood Disorders. Four: Essentials of Substance-Related Disorders. Five: Essentials of Eating Disorders. Six: Essentials of Sexual and Gender Identity Disorders. Seven: Essentials of Schizophrenic Disorders. Eight: Essentials of Personality Disorders. Appendix A: Glossary of DSM-IV-TR Terms. Appendix B: Essentials of the Multiaxial System and How to Code an Individual Using the DSM-IV-TR. * Features quick reference boxes, "Test Yourself" questions, and numerous case examples.